We were excited to read that new owners had taken over the old Percy's pub in Carlton and turned it into an all-vego pub with a Middle-Eastern vibe. We quickly rounded up a gang and got along to check it out. The fit-out is comfortable and a little retro, with a few high pub-style tables in the front bar and a casual dining room out the back. The staff are hugely enthusiastic and were almost overwhelmingly helpful on our visit. I imagine things will get a bit more slick and efficient once they settle into their rhythm, but we had staff checking in every few minutes. The menu is a mix of small plates and mains, with most of the vegan options among the former. We shared a bunch of dishes between the four of us for near-comprehensive coverage of the Green Man's Arms' food. 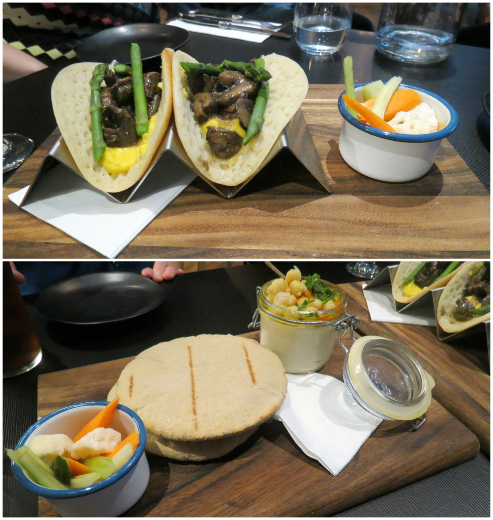 First up was two serves of the Yemeni lahuh bread filled with asparagus, mushroom ragu and fresh creamed corn ($6.50 each), and the house made hummus with pita bread and pickled veggies ($8.50). The breads were fantastic - the lahuh bread had an injera-like texture, but a sweeter flavour. The hummus was solid, without being life-changing and the lightly pickled veggies that came with both dishes added a nice sharpness. The only vegan main is the house made couscous ($15), which came with a vegetable purree and some roasted beans, corn and onions. It's kind of a weird dish to be honest - you might be a bit disappointed if you ordered it as a main for yourself, and as something to share around the table it wasn't as simple to divide as it looks. Much more successful were the pomme frites ($8) - a plate of the most deliciously fried smashed potatoes, heavy on the seasonings and served with aioli and house made tomato sauce. The best dish of the night. I liked the falafel ($7) as well, although they weren't chewy enough for everyone at the table. We finished off by sharing a sample of all the desserts on offer: halva ice cream ($7, vegan and pictured left), knafeh ($10 and pictured centre) and barboosa ($8, vegan and pictured right). The halva ice cream was an impressively creamy vegan version, with some Persian fairy floss and hazelnuts to keep things interesting. The knafeh was a crisp-edged ricotta-stuffed pastry served with pistachios, pickled grapes, syrup and some weird little jelly cubes. The barboosa was a very sweet semolina cake, served on top of a rosewater infused coconut cream. I think we all had different favourites, which is a good sign. It's great that the Green Man's Arms is offering up another decent veg option in Carlton, but we were only partially wowed by this early visit. The menu needs a few tweaks I think - some more (and more interesting) vegan mains seem like an obvious addition. It will be interesting to see how this pub develops! Accessibility: The entry has a small lip from the street and there's a step up between the front bar and the dining room. We had full table service and didn't visit the toilets. Good to hear how you found it - I haven't managed to get there but am really most excited about kombucha on tap - that is my kind of pub - but am quite keen to try the food too. At least the smashed potatoes look like kid-friendly food so maybe can go there with family because tried to suggest a work dinner there but was too far away!!!! Hi Johanna - yes, I think you might enjoy it and hopefully the smashed potatoes will suit Sylvia. This place was super close to where I was just staying in Melbourne, but to be honest I was a little underwhelmed by the menu, especially the one vegan main option, so we went a bit further afield to places with more exciting food for us. But I had it in the back of my mind as a back up for if we were tired and just needed something not too filling. Hi Susan! I agree that only one vegan main is an oversight, we probably enjoyed the snacky end of the menu most anyway. Looks and sounds different from media write ups, thank goodness for bloggers! Ha! Glad we could offer you an alternative perspective, tytty. Really poor service. Attended a dear friends birthday recently and, after being told it was OK in advance, was advised in very authoritarian fashion that a la carte dining was "not allowed". Not quite 2019 customer service???? ?